is renowned worldwide for his accomplishments and contributions to bluegrass music: the hot-picking force in several trend-setting bands including Hot Rize, respected author and teacher, songwriter, and long-term President of the International Bluegrass Music Association. Pete's national music career started in 1971 with the first records by northeast instrumental wizards Country Cooking. Founding Hot Rize in 1978 led to an enduring stint as a performing artist, appearing throughout the U.S. and three continents, on national television and radio. Pete's instructional books, CDs and videos include best-sellers in their respective fields: Bluegrass Banjo, Bluegrass Songbook, How to Make a Band Work, and many others. A pioneer in bluegrass music instruction, since 1980 his banjo camps, bluegrass jam camps, and clinics have inspired players nationwide and overseas. Pete took up banjo as a teenager in his native New York City, closely studying Earl Scruggs records. While completing B.A. and Ph.D. sociology degrees at Columbia University, he played in local bands and hosted the New York metropolitan area's only bluegrass radio show in the 1960's. 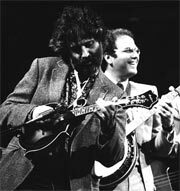 In the early 70's while a sociologist by day at Cornell University in Ithaca, New York, he formed Country Cooking whose innovative recordings helped usher in a new wave of contemporary bluegrass. In 1976 Pete moved to Colorado where he recorded Dr. Banjo Steps Out (Flying Fish) and soon after started Hot Rize, with Tim O'Brien, Charles Sawtelle, and Nick Forster. The foursome became a major attraction and creative force in bluegrass, famous for their dynamic stage shows and finely-crafted recordings. The group scored repeated #1 bluegrass radio hits, including the Wernick-penned "Just Like You", and was the first recipient of the IBMA's coveted "Entertainer of the Year" award in 1990, as well as a Grammy nomination the folliwng year. The band's daffy alter-egos Red Knuckles and the Trailblazers gained a following of their own, with Pete as Waldo Otto, steel guitar player and donut impresario ("You Bite It, You Bought It"). In 1990 Hot Rize disbanded as a full-time unit, while continuing to make selected appearances. Pete went on to join forces recording and performing with cutting-edge musicians Jody Stecher & Kate Brislin, Jeff White, Chris Thile, Peter Rowan, and Jerry Douglas. Pete's 1993 solo album On a Roll (Sugar Hill), won high praise, presenting a wide-ranging mix including traditional and progressive bluegrass and the debut of his innovative bluegrass/early jazz band, the Live Five, later renamed FLEXIGRASS. The album rode the bluegrass chart for over a year, with another #1 hit, Wernick original, "Ruthie". Pete has performed with many musical legends, from Doc Watson to Bill Monroe and Jerry Garcia. 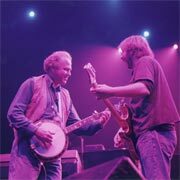 But perhaps his most high-profile and exciting appearance was in September, 2005, performing on the David Letterman show with his lifelong inspiration, Earl Scruggs, along with Steve Martin and two other players, backed by Joan Wernick and son Will Wernick, picking a high-speed "Foggy Mt. Breakdown". The group, called Men With Banjos (Who Know How To Use Them), also performed at the New Yorker Festival. 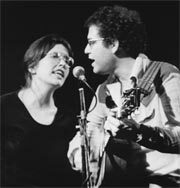 Pete's current performance schedule centers around appearances with FLEXIGRASS, Hot Rize and with his singer/guitarist wife Joan as a duet ("Dr. and Nurse Banjo"). FLEXIGRASS' 2007 release shows the band's unique combination of banjo with clarinet, vibraphone, bass, and drums continuing to forge new pathways combining traditional and modern elements in American roots music.